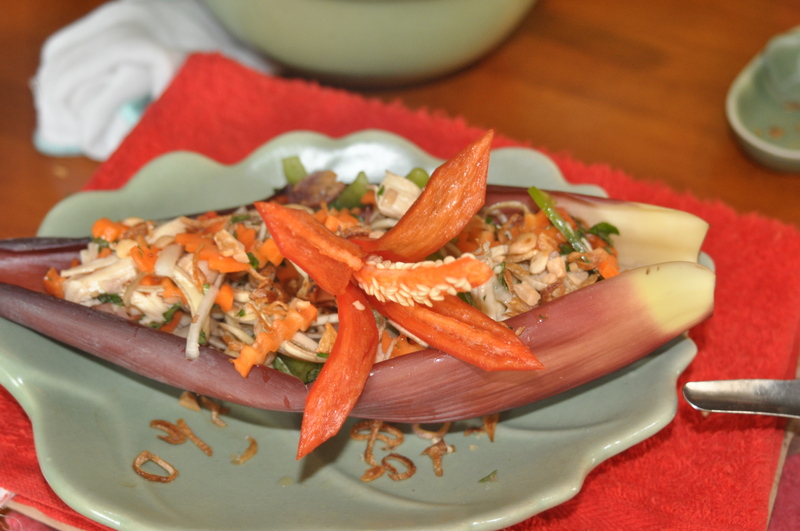 This Vietnamese salad uses an ingredient called banana blossom. 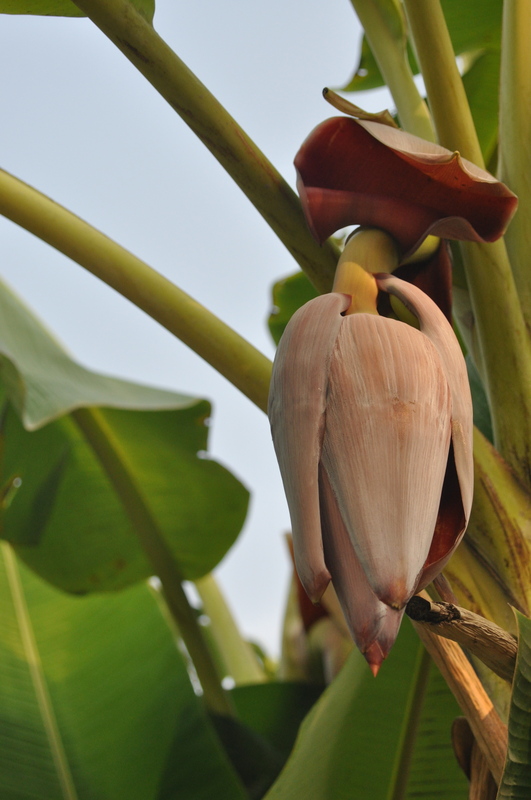 A banana blossom is basically the flower out of which a cluster of bananas will eventually grow. The outer leaves have a deep red/purple color, but the leaves inside the flower are a faint yellow color. The inner leaves of the flower taste a bit like the skin of a big yellow banana, but then a lot less bitter and horrible, if that makes sense? Place the chicken in a saucepan and cover with water. poach over medium heat for about 20 minutes. Remove from the heat and set aside to cool. When cooled shred the chicken along the grain into thin strips. Cut the banana blossom in fine strips and soak in a large bowl with iced water for 20 minutes to remove the slimy residue and to prevent from discoloring. Then drain with a cheesecloth until dry. Peel and finely slice the shallots and deep fry until light brown and golden and set aside. Combine the banana blossom, chicken, onion, carrot, green pepper, fish sauce dressing, laksa leaves and peanuts in a large bowl and toss well. Arrange the salad on a serving platter and sprinkle with crispy fried shallots. Serve immediately and enjoy!